Fire crews on Wednesday battled flames at an abandoned building. 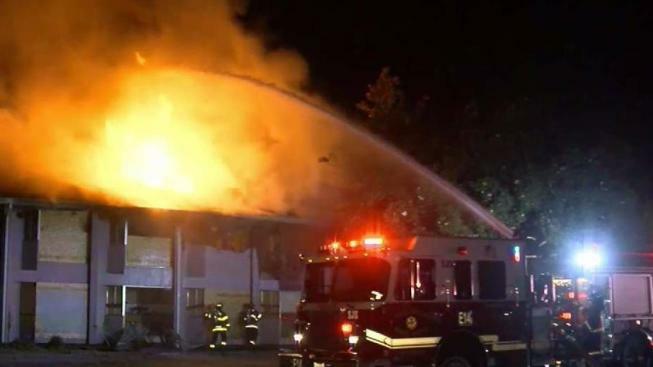 Fire crews battled a three-alarm blaze at an abandoned building in San Jose early Wednesday, according to fire officials. The blaze broke out around 2:20 a.m. at 3924 Williams Road, a location that used to house medical offices. The fire has since been contained, but crews remained on scene to battle any hot spots. The firefight at one point proved troublesome when a supply line burst, temporarily cutting water access to firefighters. At that time, crews were forced to pull out of the building and battle the fire from a defensive position. Despite fireworks lighting up the night sky late Tuesday and early Wednesday, fire crews do not believe that fireworks caused the blaze because the origin of the flames came from the inside of the building. Moreover, one person told fire officials that they saw people leaving the building after the blaze broke out. "In this case, it's very common for boarded up facilities to become kind of de facto homeless encampments," San Jose Fire Department Capt. Mike Van Elgort said. "I hope that wasn't the case here, but the fire did start inside." Firefighters searched the structure and found no one inside. Some people in neighboring homes were temporarily evacuated as crews worked to extinguish the blaze.